If you know the story already, you know Sky’s transformation is imminent. If you didn’t know…oops, sorry for the spoiler! Anyway, this was probably the only page where I had to go back to do a “pick-up shot” after it was already done (in film terms, a “pick-up shot” is a minor shot done after principal photography has wrapped to make up for something that was missed the first time around or something determined to be needed to enhance the storytelling in the editing stage). In this case, the panel 3 close-up of Sky originally wasn’t there. 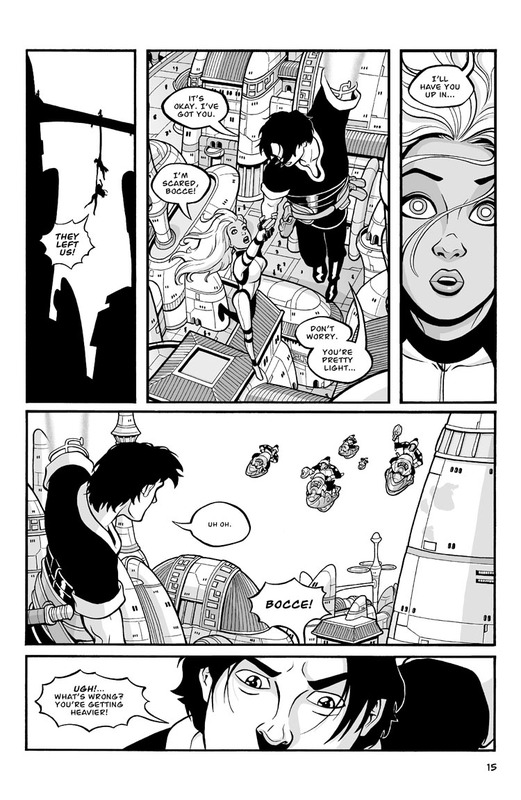 Instead, panel 2 (Bocce and Sky dangling) was a much wider panel that took up that space. But I knew Sky was going to go through her transformation on the next page and her change in look was going to be a big deal. But after completing all the art and reading it all together, I realized that Sky had not appeared in close-up in many, many pages. With all the action going on, she was only in a handful of panels, and always fairly small in panel, so I was concerned that her normal look would not be emblazoned in people’s minds prior to the change. So I went back and added the close-up panel of Sky to this page, and I now think the sequence works much better since you now have clear shots of the two different looks practically right next to each other, and that drives the transformation home a bit more. Sean, I love the fact that you provide all of the commentary. It’s nice to know a bit more about what you were thinking, etc. and it actually enhances the story – at least for me. I met you years ago at SDCC which is where I first learned of Runners. Looking forward to the new storyline later this year. Thanks, Sean! I’m a big fan of commentary tracks on DVDs, especially when it’s the director or writer explaining why they chose to do (or not do) certain things and the thought process behind the storytelling. I’m much less interested in commentary where people just joke around and tell anecdotes about something funny that happened at craft services that day, since I don’t get anything out of those kinds of commentary. Anyway, I wanted my commentary to do more of the former and less of the latter, so I’m glad to hear that people are enjoying the peek behind the curtain! wheehoooo! Just finished reading the story so far. Great Stuff! Keep the commentary coming, it helps a lot. I tell friends to pay attention to whats happening in the background in movies and tv programs, cause that’s where a lot of the funny stuff is going on, and you just prove that in page after page of your work. Thanks. Thanks for checking out RUNNERS! Glad to hear you’re all caught up on this story, especially with the next one about to start very soon. And have I mentioned it will be in COLOR??!! I also really like your commentary (obviously), but what I like even more is that it is so interactive. You do see that very much outside of gallery openings and comic conventions. I completely agree with Gerren. Love the extra details only available in the commentary. It’s really fun for me too! I try to put a good amount of thought into the universe, so it’s nice to share some of that info where it wasn’t necessary to shoehorn it into the story itself. And it’s also nice to get feedback on what’s working and not working. Originally, my main reason for doing it was to make the webcomic attractive to people who already read the story in graphic novel form. I wanted to give them something new. So even though the next story arc will be all new to everyone, I’ll still be doing the commentary since I’m really enjoying it, and other people seem to be too. Yeah, definitely digging the commentary; I’d reread the story on paper without it. It’s interesting to know why Sky got a couple significant close-ups earlier on. At the time I assumed it was representing Bocce looking closely at her or something.